It is easy as 1-2-3 to sell your clunker today. Sell your clunker today and get immediate payment when we pick up your car. Cash for Clunkers today! In order to get started, please fill out our simple form, or give us a call at 1-800-407-1969. We look forward to giving you top dollar for your clunker. Easy – Only takes 3 easy steps to sell your clunker within 24 hours. Price – Due to our extensive network of buyers/auctions throughout the United States, National Cash 4 Cars is able to offer you the absolute highest price for your clunker. Cash for Clunkers! Stress Free – National Cash 4 Cars buys all types of clunkers, all makes and models; all conditions. Free Pick-up – Our drivers will come to your location to pick up your clunker, and give you your money on the spot. Convenient – 150 locations serving the entire United States, we are ready to buy your clunker today. Courteous – National Cash 4 Cars works with it’s customers to ensure the smoothest selling experience, and strongly values the lifetime partnership with our customers. Expertise – Over 50 years of automotive experience. Cash for Clunkers today! Top dollar paid, sell your clunker the stressfree way. A few years ago, the phrase "cash for clunkers" was all the rage. An individual could trade in an old car, no matter what the condition, and receive cash from the federal Government. 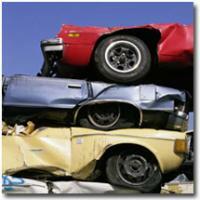 Those days have come and gone, but the necessity of getting rid of older vehicles still remains. While you could go through a lengthy process of trying to sell it on your own and hope that you get the right amount of money for your car, you could speed along the process by simply selling online. Not only will it be faster, but the process is far friendlier than you might imagine. We will pay you cash for Clunkers today! Astonishingly enough, there is a fairly major cash for clunkers industry. There are many reasons for this of course, ranging from those businesses that want to fix up the vehicles to sell them for relatively low prices to those that are merely in the game for the parts. Regardless of the reason, though, a rather thriving industry exists. For those that have clunkers, it is truly a seller's market. Rather than dealing with the vague promise of being able to make a few bucks through the traditional sales route, one can sell online and quickly pocket a bit of cash. There are many benefits to selling online, but perhaps the biggest for most cash for clunkers sellers is the sheer ease. Rather than having to pay for a listing or manage multiple website ads, one can simply contact the appropriate company (like National Cash 4 Cars) and have the vehicle sold. There is no haggling for price, there is no awkward negotiation over the condition of the clunker - the vehicle is simply sold as-is, with little work to be done on the part of the seller. Of course, it is also nice to be able to seek out cash for clunkers in a system that rewards the seller. When selling a car that is not in the best of shape, most sellers have to go out of their way to deal with any buyer that is willing to take a look at the vehicle. By selling online, though, you can turn the tables. National Cash 4 Cars treats sellers as if they were valued clients, and provides great customer service throughout the selling process. Rather than having to work hard to sell your vehicle, you can get cash from a company that really wants it. Getting cash for clunkers is a fairly simple process when selling online. One simply starts by going to the appropriate website, and then submits the relevant information about the vehicle using the form provided. An offer will then come back, usually within an hour, which you can take or you can leave. All that is left is to choose whether or not to accept the offer, and then the vehicle can be picked up at your home and cash will be delivered alongside the pickup. It is incredibly simple, and leaves all the power in the hands of the seller. If you want to get cash for clunkers, the best option really is to sell online. It is easy, friendly and you can get your money fast. If you have a car that is on its last legs or if you simply want to get cash in order to get a new vehicle, it is always better to go through such a service than to try to sell the car on your own. Rather than wasting time hoping for a sale, you can quickly move on with your life and get back to more important business. Some Facts about the Cash 4 Clunkers program. Cash For Clunkers legislation cleared a huge hurdle as it was attached to the back of a “must sign” Iraq and Afghanistan funding bill. While some still feel that the bill does not go far enough with requirements for higher fuel efficiency, it now appears that the bill is headed to the next step, approval by both chambers of Congress to pass the Cash 4 Clunkers Bill. The bill as passed would require trade-ins to be manufactured after 1984 and have MPG of 18 or less, owned for at least 1 year and be in driveable condition. Vouchers up to $4,500 would be available to purchase vehicles under $45,000 if they provide a 10 MPG improvement on the trade-in. Cash For Clunkers help jump start the American Auto industry. BUFFALO, N.Y. Press release – U.S. Senator Charles E. Schumer on Thursday, April 16, 2009 detailed his legislation to create a national voucher program, known as “Cash for Clunkers”, that would enable and encourage Western New York drivers to trade in their older, less fuel efficient cars, trucks and SUVs for more fuel efficient vehicles. April 17 (Bloomberg) — U.S. lawmakers may let cars made overseas qualify for a proposed “cash-for-clunkers” program in a bid to secure passage of the measure, designed to help revive domestic auto sales at a 27-year low. An option under consideration would distribute subsidies to new-car buyers based on manufacturers’ U.S. market share, said Representative Betty Sutton, sponsor of the proposal. The approach may overcome objections that Sutton’s original plan subsidizes North American-made (Cash for Clunkers) products only.